Theresa May has said a joint UK and Ireland bid to host the World Cup would help strengthen relations between the two countries post-Brexit. The Prime Minister described the 'tantalising' prospect of hosting the 2030 tournament as she outlined ways to bolster the bilateral relationship with the Irish Republic when the UK leaves the EU. Diplomatic ties between London and Dublin, which have improved markedly in recent decades, have been put under renewed strain during the Brexit process. On a visit to Belfast today, Mrs May said people on both islands 'yearned' for a 'close and trusting' relationship. 'Both the UK and the Irish Governments have already made clear that we would support the tantalising possibility of a joint UK and Ireland World Cup Bid for 2030, should our respective football associations choose to pursue this,' the Prime MInister said. 'We also want to find creative ways of enhancing the links between all our peoples - and in particular, to build the links between our young people. 'I know there is a sense that many British people do not know enough, or understand enough, about the complexity of the long relationship between the UK and Ireland. 'And a sense that some Irish people are less familiar with the forces and motivations that help to shape views in the UK. 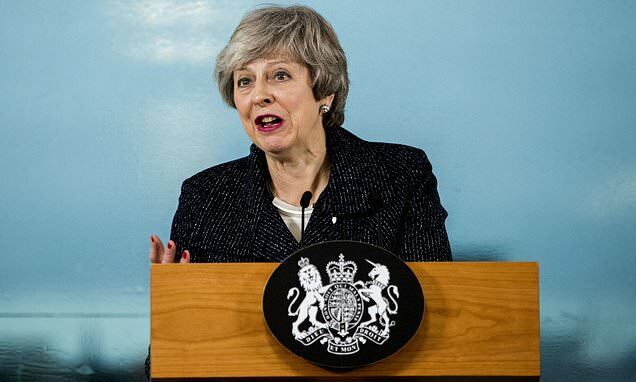 Mrs May, who is struggling to break the political impasse over Brexit, gathered Cabinet before heading to Northern Ireland as the UK faced the possibility of crashing out of the EU in less than eight weeks.